Healthcare is highly regulated and compliance-heavy, discover how cloud-based HCM can help improve your organization. The healthcare industry is one of the most highly regulated and report-intensive industries out there. From multiple shift schedule to constantly changing legal regulations there is a lot to stay on top of. A unified, cloud-based human capital management solution can assist in streamlining processes as well as allow for easier onboarding. Leaders in the healthcare industry have already transitioned to a comprehensive HCM solution and are seeing incredible results. Hear from multiple industry leaders to see how their workforce overcame unique healthcare industry obstacles, and how your workforce can experience similar results. Read the full article below or download printable version of the Business Performance Toolkit for Healthcare Organizations. What can streamlined people management tools offer? When it comes to human capital management (HCM), the healthcare space has some of the most unique and complex needs found within any industry. Healthcare organizations contend daily with challenges ranging from tracking payroll and benefits for hundreds of employees to quickly filling key positions with the best talent available. Employers in the healthcare field know how time-consuming it can be to balance providing quality service to their clients with effective, streamlined administration of their employees. Healthcare organizations can benefit now more than ever from the power of comprehensive people management delivered in the cloud. 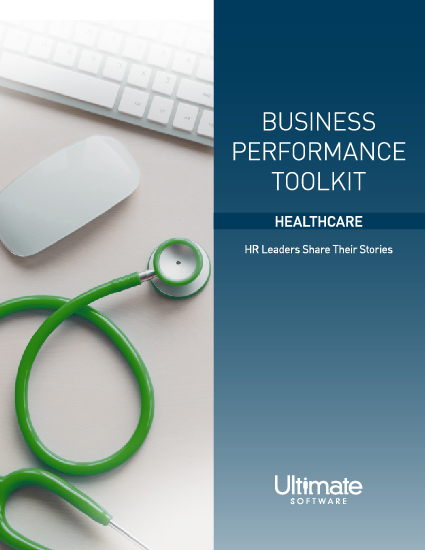 In this toolkit, you’ll discover how a variety of leading companies in the healthcare industry are streamlining time-consuming HR processes, reducing time to hire, and saving thousands in administrative costs. Tracing its roots to the Home of Mercy founded in Chicago in 1886, Covenant Retirement Communities (CRC) is a network of 12 not-for-profit retirement communities across the United States. CRC's facilities offer innovative health programs, full-time care, and various amenities to more than 5,000 residents. In the past, CRC relied on a fully outsourced third-party vendor to manage its complex payroll and benefits administration. With more than 2,800 active employees, the organization previously had at least a dozen decentralized databases and multiple payroll accounts spread across a handful of payroll service bureaus-a logistical nightmare for its HR staff that was beginning to impact other departments as well. In 2004, CRC abandoned its multiple providers in favor of a single comprehensive HR and payroll solution. By bringing a multitude of formerly outsourced processes in-house, the organization was able to create new efficiencies, reduce errors, provide online access to benefits information for its employees, and cut costs. "Our process used to be 100% reliant on forms, manual data entry, and spreadsheets. With such a sizeable volume of changes every year, we faced discrepancies, audit issues, and reporting problems," said Jerry Davis, CRC's Payroll Manager. "Now we manage information ourselves with configurable reporting, and handle open enrollment online. We don't have to pay a benefits outsourcer, our benefits data is finally accurate, and our employees appreciate convenient Web access to their information." Armed with a unified human capital management solution, Covenant Retirement Communities was able to dramatically simplify once-complex manual tasks into automated, paperless processes. These innovations reduced waste and eliminated mailing costs while simultaneously enhancing accuracy. CRC was also able to leverage powerful reporting capabilities in order to take critical strategic action in budgeting and planning. With information consolidated in one system of record, their HR team is able to use a plethora of industry metrics to analyze compensation and benefits. "HR is becoming stronger and other departments are turning to us first when they have an issue that impacts our workforce," said Davis. "Executives now know we can quickly deliver the reports they need, which is crucial to our organization." "We don’t have to pay a benefits outsourcer, our benefits data is finally accurate, and our employees appreciate convenient Web access to their information." eClinicalWorks is a leader in ambulatory clinical solutions that harness new technologies to create community-wide electronic health records for patients. The organization is highly decorated with numerous TEPR (Towards the Electronic Patient Record) awards, and serves more than 55,000 healthcare providers and over 250,000 medical professionals in all 50 states. Federal initiatives have invested billions of dollars to help doctors, hospitals, and other medical agencies convert and unify their paper medical records and patient histories into a secure electronic record. In response to this new technological demand, the solutions offered by eClinicalWorks have made the company one of the fastest-growing clinical system providers in the United States. The struggle to manage this accelerated growth led the organization to seek a new HR and payroll solution in 2008. After selecting full-featured people management delivered in the cloud, eClinicalWorks empowered its employees and associates with self-service access to compensation history, benefits information, and other personal and payroll data. Gone are the constant calls to the HR department to resolve discrepancies, look up historical information, or manually retrieve paystubs-enabling them to focus on streamlining processes and more strategic activities. For example, eClinicalWorks' IT professionals working on temporary H-1B visas have usual pay protocols, requiring a paystub each time they leave the country. Prior to adopting cloud-based HCM, this was a logistical headache that has now been completely eliminated with the ability for employees to obtain their own stubs in seconds. By simultaneously taking advantage of cloud-based recruitment, eClinicalWorks also furthered its goals of managing growth by dramatically reducing the time it takes to review hundreds of job applications. Instead of an arduous manual process, the company's HR professionals can now review applicants electronically, evaluating candidate histories, and send relevant information to hiring managers all without any workflow delays, privacy or security concerns, or the need to use a single sheet of paper. Applicants are automatically notified when their résumé has been received or if more information has been required, and centralization eliminates the possibility of duplicate data entry. Fully leveraging this technology alongside rapid growth has also led eClinicalWorks to take advantage of powerful metrics and reporting to help control costs. Using advanced Business Intelligence, the company tracks time-to-hire, cost-per-hire, job-opening statistics, effectiveness rates from applicant sources, productivity, and ultimately the success or failure rate of every dollar spent on recruitment. "We immediately realized that we have so much more information at our fingertips than we ever had before," said Diane Burrows, HR Director at eClinicalWorks. "We are so pleased to have real-time access to our employee information so that we now have a truly complete view of our workforce for forecasting, day-to-day reporting, and meeting the demands for regulatory compliance." With over 500 care centers nationwide treating nearly 200,000 patients per year, Jacksonville-based Healogics is the largest provider of advanced wound care services in the United States. The organization treats a wide array of patients with its extensive medical network and an evidence-based, systematic approach to chronic wound healing. Healogics employs over 2,200 workers including staff at each of its locations as well as contractors, temporary workers, and hospital employees. This highly diverse workforce, alongside rapid expansion, made a unified, cloud- based HCM solution a perfect fit to help the provider drive strategic business decisions. By leveraging powerful reporting tools, a high degree of configurability and the flexibility to accommodate new locations and employees, Healogics has experienced continual growth while streamlining efficiencies. After the provider finalized a significant acquisition, it experienced an immediate 50% increase in the size of its employee base. Whereas a system relying on multiple providers or service bureaus might have added numerous headaches to this equation, Healogics instead relied on a single best-in-class cloud HCM solution and had every new employee live within about 30 days of the acquisition. Cloud technology has enabled the provider to meet its unique and complex business needs in the healthcare field while simultaneously automating and streamlining many administrative processes. This has resulted in reduced errors and paper waste, hours of manual data entry saved, and a refocusing of resources on the strategic activities that matter most. Workflow processes, such as onboarding new hires or managing time and attendance, have become more efficient and accurate than ever. According to Payroll Manager Aimee Morgan, "Within 20 minutes of being hired, new hires can have a time sheet. And if something changes for an employee, we immediately see the change made in every area across the solution. We've achieved huge gains in efficiencies." The HR and payroll teams at Healogics have noted an improved employee experience across the board with easier access to critical information and faster, more collaborative communication between teams. Healogics has also taken full advantage of their people management solution's reporting and business intelligence tools for strategic insight. Because all workforce-information is unified in one location, the company can report on an enormous number of metrics such as average turnover by role, get headcounts per location, or report on trends to help with the allocation of resources. "With high levels of visibility and accuracy, our teams can identify how many nurses it takes to run a specific Wound Care Center and we can report on every person who is working at each of our facilities," said Morgan. Organizations in the healthcare sphere are uniquely poised to take advantage of the tools offered by comprehensive HCM. Leveraging a best-in-class solution from a trusted provider can empower your enterprise to take on healthcare industry challenges efficiently, eliminate convoluted manual processes, and plan for the future. To learn more, watch a brief overview tour and click here to download the Business Performance Toolkit Whitepaper for the Healthcare Industry. Please fill out this brief form to access your healthcare toolkit.